There is no excuse in visiting IKEA on a Sunday before watching 22 millionaires with daft hair styles kick a football around on live telly. The weather was cold and the air was full of autumn drizzle and as I turned into the car park the scale of the folly dawned on me; the IKEA car park was bursting at the seams. Cars were on pavements, on grass verges and on the approach road; grim. There were entire extended families pouring out of cars and into the store. In parallel, equal numbers were exiting before trying to squash brown flat-packs of “destroy it yourself” furniture and fittings called Grult, Splad and Twong into and onto impossibly small cars. What do these people do when they have removed all the air from their cars? Do they give granny and granddad a few coins to take the bus home? There is no way you can fit all the people and the flat-pack must-haves into some of these cars. Maybe that is why IKEA provides free rope on the loading bay; it is to strap the unfortunate grandparents onto the roof of the car. Oh well, here now so might as well join the hoards of people unable to control a shopping trolley; absolutely no sense of direction and with variable but low levels of short-term memory. I hooked a yellow bag over my shoulder, picked up a pencil and I too became a zombified IKEA shopper! I know there is a science to store layout design whether it is a Tesco supermarket, a Hornbach DIY store or an M&S type outlet. The store owner wants everyone to see everything at least once and they want exposure to be just at the right time when for example, the shopper has been subliminally convinced that the bright pink Plobo stool would look really nice in their kitchen (believe me it won't). Oh, but the chaos this causes in an IKEA store! Being a supply chain type I would make the whole store strictly one-way with shoppers not permitted to double-back to soft furnishings or for a forgotten low energy light bulb. In fact, if I had my way I would make the floors with a defined downhill gradient and ensure trolley wheels were oiled hourly to help people on their way, through the broken furniture bargain section, past the cheap fast food and out into the car park. What about a small battery pack on each trolley which delivered a persuasive electric tingle if you tried to push the trolley against the traffic? Too extreme, possibly? Think of all the wasted hours and effort of moving all the way through the store then insisting on reversing the entire route and getting in the way of everybody else. Then came my eureka moment. 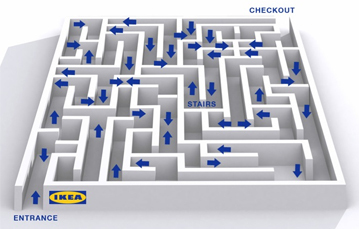 I realised where I had seen this behaviours before and why I perversely enjoyed dodging the trolleys in the IKEA maze. This is precisely what many FMCG, Brewing and Pharmaceutical companies suffer in their Route to Market distribution planning every single day. Wasted miles, wasted fuel, wasted hours and in all that time there are customers not being serviced. 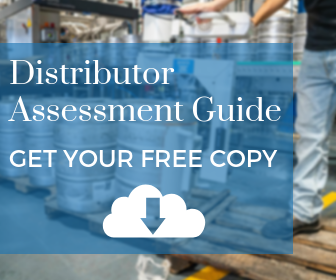 If your sales are struggling along towards the end of the year and the stream of excuses for gaps appears endless, you might take a close look at how much time your sales people spend travelling to, selling to and guiding distributors. If your sales team has adopted the IKEA system logic then you have just spotted a huge opportunity to improve your Route to Market (RTM)performance. Get out from behind the desk and have a closer look. Get some IKEA rope, tie yourself to the roof a salesman's car and see where some simple experience, thought and logic can significantly add to your bottom line. Too busy to ease yourself out of that IKEA chair? Then seek out some professional resource to take a cold hard look at how you operate RtM in the traditional trade.